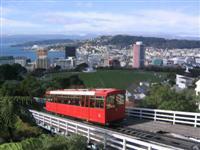 The cable car is one of the most popular tourist attractions in Wellington. It takes people to the lookout at Kelburn, where there is a beautiful view over the city and across the harbour. Visitors can either take a return journey or walk back down through the beautifully landscaped Botanic Gardens. At the top terminus there is the small Cable Car Museum explaining its history.